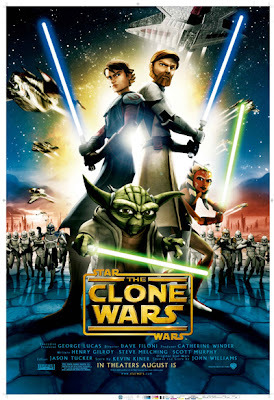 DVD Review - "Star Wars: The Clone Wars"
"Star Wars: The Clone Wars" is an animated feature presentation that attempts to bridge part of the gap between episodes II and III of the "Star Wars" films. This is only part of the story, as there is a weekly cartoon that tells more of the happenings of the Clone Wars. What we have here is a universe at war and the Jedi at their thinnest, barely holding on to the worlds which they control. In the midst of this, Jabba the Hutt's son (who knew that guy could reproduce) is kidnapped and the Jedi send Anakin Skywalker and his new Padawan, Ahsoka, to find him. Chaos ensues. ...because that's about all it was. Sometimes I wonder if George Lucas secretly likes being hated. Since 1999 it's like all he's trying to do is rip my childhood memories away from me and set them on fire right in front of me while laughing like Hans Gruber. It's just not fair to be given the gift of "Star Wars" only to have all of its greatness tainted by Jar Jar Binks and (even worse) Hayden Christensen. I guess "Clone Wars" is supposed to be for kids so maybe we can forgive the childish dialogue and questionable voice talent. But how do I reconcile a story that seriously plays out like an episode of "Full House" with aliens? Just like everything else in the "Star Wars" universe post-1985, the entire thing comes across as only half plotted; the rest is just thrown together on the fly, like a middle-of-the-show SNL skit. We're now looking at two entire generations of kids who only have this type of crap with which to form an opinion of "Star Wars" upon. Curse you, George Lucas. Curse you.